So when we were contacted by Mitchell Waite, the creator and owner of the iBird family of apps, offering a promotional code for the new version of iBird Ultimate in return for a review I thought, why not? And having agreed to do a review I felt obligated to dig into some of the other features of the app that I hadn’t even known existed up until now. 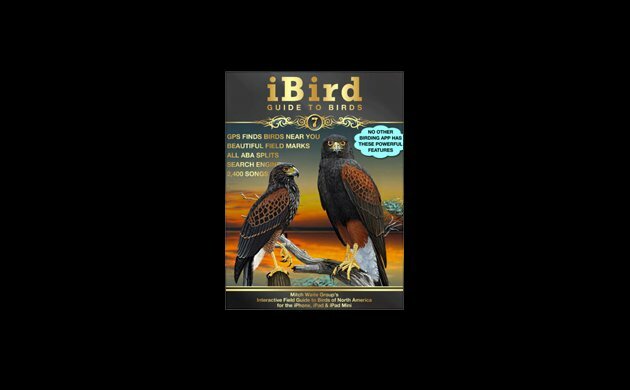 What else does iBird Ultimate offer? Well, it works decently as a field guide. You can easily scroll through the 940 species of bird included, which covers the United States (including Hawaii) and Canada. What’s nice about using an app instead of a paper field guide is that you can search by name, banding code, or Latin name and you can also reorder the species taxonomically or alphabetically by first or last name or gather similar species together into family groups. A nice touch is the option to view the app with black print on a white background or, if you want to save battery life and not illuminate the entire area, you can use it with white print on a black background. The illustrations are passable but we certainly aren’t talking about artwork that will win contests. What’s important is that field marks are shown and recognizable and this is one of the ways that this app really shines. When looking at the “plate” for a species and you can toggle between “field marks on” and “field marks off.” Sometimes you just want to look at the pictures and sometimes you want key field marks labeled. In iBird Ultimate, you get both, as well as a brief mention of at least one similar species and key points of differentiation. You can also click “similar species” and get more information on other species that might be confused with the one you are looking at. Many species are shown in a variety of plumages and positions. 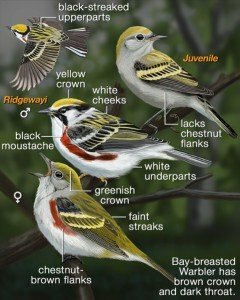 For example, the Chestnut-sided Warbler is shown in male and female plumage as well as juvenile plumage and in flight from above. All four images are on one plate but you can scroll down and see the same four images as stand-alones. You can also click for photos. 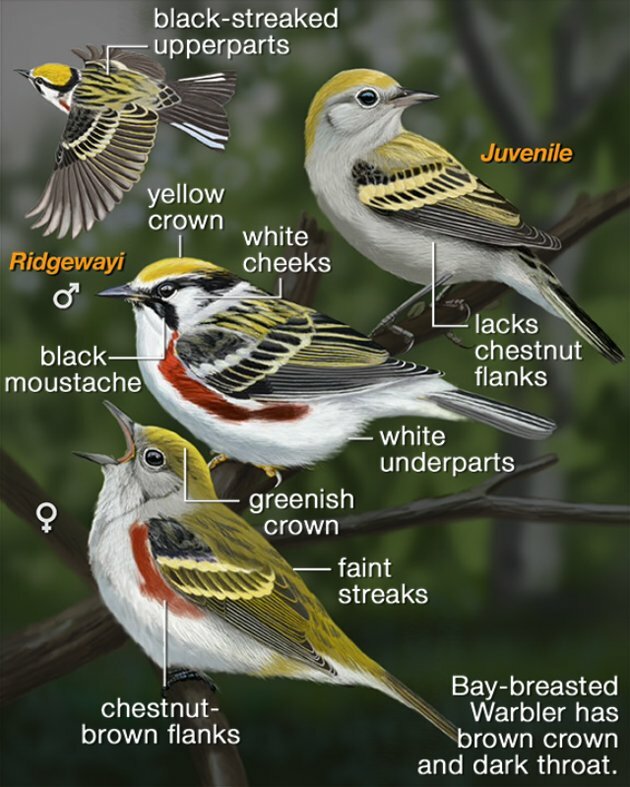 In the case of Chestnut-sided Warbler there are two shots of males, one of a female, and one of an immature. It’s very nice to have photos to go with the illustrations and you can submit your photos if you want to help build up the image library. Not all species are treated as well. Inexplicably, Red-headed Woodpecker only has illustrations and photographs of adult birds with a full red head which could leave someone looking at a juvenile bird with a brown head very confused unless they read the text. Red-shouldered Hawk has only the eastern subspecies illustrated but there are photos of Florida birds and California birds. Range maps are largely accurate and there are thirty-seven subspecies maps, helpful when you are dealing with potential future splits like White-breasted Nuthatch. Some of the more rare birds are overly mapped. For example, Little Stint is shown as year-round along the coast in the mid-Atlantic states, though the text does make clear that it is a vagrant. Important to me, as I mentioned above, are the sound files. Most species have at least one recording and many have multiple sound files available, from songs to chip notes to alarm calls. The quality of the recordings is generally high and they are clearly labeled as to what is included in each recording. The only problem I have with the way the app works in regards to sound is that as soon as you press the “sounds” button the first recording, generally the bird’s song, starts playing. If what you wanted to do was listen to a chip note to see if the bird you are hearing calling from the bushes is what you think it is then hearing the bird’s song instead is, at a minimum, annoying, and could potentially chase the bird away. Hopefully future versions of the app will include a way to choose which recording you want to play and won’t automatically play anything when you are accessing the sounds menu. There are some very interesting features that try to help narrow down the number of birds you are dealing with. If you are having a hard time identifying a species you can put in some attributes and see what comes up that could match your bird. For example, I entered that the bird was small (5-9 inches), had red as a “prominent” color, and was common in my location (New York). Five results came back: Northern Cardinal, Red Crossbill, Rose-breasted Grosbeak, Scarlet Tanager, and Red-headed Woodpecker. Those seem pretty reasonable but I am not sure what would have happened if I were looking at a male House Finch. Similar results happened using blue as a “primary” color with the other attributes remaining the same. Eastern Bluebird, Indigo Bunting, Purple Martin, Barn Swallow, and Black-thr0ated Blue Warbler came up. No Blue Grosbeak, no Tree Swallow. While this function is a great idea it is going to take quite a bit of refining to get it to the point that the results are where you would want them to be. Similar issues come up when you just try to narrow down the 940 species to what is “common” in your area. Included on the list of species that are considered “Location Common” for New York are Corn Crake, Prairie Falcon, Black-tailed Gull, Eurasian Jackdaw, and Little Stint. Finding any of those birds in New York would would result in a twitching stampede and none are even close to common. I’m not sure where the data to make the determination of what is and is not common is coming from but it needs to be refined. Despite the occasional weaknesses in the more advanced features of the app it is overall a worthy, though pricey – currently at $24.99 in the App Store – purchase. Considering what birders spend on field guides though, and the sheer number of birds and other features that this app includes, that price is not out of the ballpark. Like I said earlier, I had initially bought an earlier version of iBird Pro just so I could have a sound library on my phone. I still use the sounds but I now also use the app for occasional help with field marks and as a quick review as I get out of my car at the location of a twitch. It saves my having to carry a book with me and though it does not entirely replace the authoritative field guides it is a great tool to use in the field. I was provided with a free download of iBird Ultimate 7.2 by the Mitch Waite Group in order to do this review. In the interests of full disclosure, the Mitch Waite Group has also inquired about advertising on 10,000 Birds. Neither the free download nor consideration of advertising revenue influenced the content of this review. I downloaded the app to my iPhone 4s, which is the only device on which I used the app. Thanks for the review of iBird. I have used Pro for several years. Recently I noticed that it omits depiction of the female plumage rather often. I surveyed the first ten members belonging to species beginning with the following letters, and counted how many portrayed the female: A (2/10), D (2/10), H (4/10), N (4/10), T (1/10), Y (1/10). Is it the same in Ultimate?